The earlier we start to teach children a foreign language, the easier it is for them to get a grasp on the language. Mixing Hebrew words into the religious school and Judaic aspect of school can help make students more comfortable using the language. Integrating Hebrew into Judaics class is a clear indicator for children of how the language is central to our religion. If Hebrew is intertwined with Judaica, it may make it easier to get students and families to attend classes because they don’t have to attend a second lesson each week. If we find our school struggling to retain teachers, only needing them to work one day a week could be an incentive. Having a specific time to teach Hebrew can get both teachers and students better in the mindset of learning this challenging language. Teaching Hebrew on a separate day and time can be clearer for your students and can make it easier to assign work outside of class. You may actually have greater attendance at Hebrew school if it is on a separate day and time—for example, if Sundays don’t work well for a student because they have soccer games, maybe Tuesday nights are better, and that’s when Hebrew class takes place. Similar to how students have varying availabilities, you may be able to snag a great Hebrew teacher that is only available on a certain day of the week. It is possible you will have a teacher who isn’t comfortable teaching both Judaica and Hebrew, and having separate classes would allow them to only teach to their strengths. You can say that again: In Shreveport, Louisiana, Rabbi Jana De Benedetti discovered a fun and interactive way to teach Hebrew—using an iPhone and the microphone attachment. She has her students talk into the microphone and say their name or a sentence in English, while the keyboard is switched to Hebrew, and Hebrew words are typed out. The students then have to read the sentence. They learn new words and learn how to read without vowels without even realizing it! דֶלֶת (Delet) on the Door: This is a classic, yet underutilized, Hebrew trick. By labeling everyday items in the classroom with their Hebrew name, students subconsciously learn valuable vocabulary words. Refer to these objects in Hebrew instead of English, and you win bonus points בַּכִּיתָּה (bakitah, in the classroom). LEGOLAND®: DIY Hebrew Legos are already a hit in Texas—everywhere from Dallas to Houston. Simply use a thin permanent marker to write (or have your students write!) letters with vowels on the side of Legos (they can come from prayers or just be random) and then watch the students have fun piecing words together. 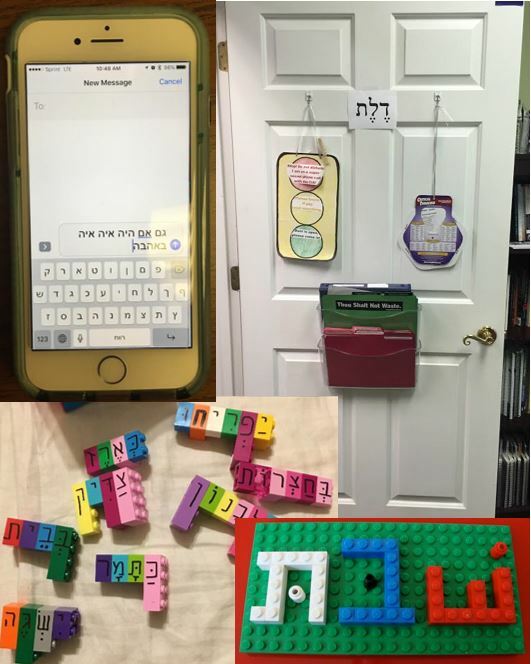 For younger students, give them a bunch of Legos and a base, and have them construct Hebrew letters and words.